Our “retired” neighbour, Farmer John, has an 80 acre scrub block about a kilometer from our house. I say “retired” as I think he still works more than anybody I’ve ever met, with the exception of me of course. 🙂 Anyway, he has this scrub block and he runs cows on it. He buys them from the markets as little fellas, puts them on the scrub block with fairly low stocking rates, and lets them get fat. Over summer he’ll supplement their feed with cracked grain and/or rolls of good hay. The result is true free-ranged, grass-fed beef. The problem we face here is that farmers can be strangely risk adverse. It’s strange because their entire living is risky and completely dependent on the elements. With that in mind you’d think they’d take risk in their stride, but many of them really don’t. In this case, Farmer John buys these little calves, fattens them up, produces an absolutely premium product, and then sells it cheap to a middle-man. He’s happy because he doubles his modest investment with no risk. I bet that middle-man is happy because he’s getting a product where he can make 500% on the cheaper cuts and over 1000% on the prime cuts. Hell, John even pays to get the beasts transported down there, the middle-man just sits back and has this amazing product delivered to his door. That bothers me. We don’t currently have the land to run cattle, though we want to change that in the not-too-distant future. It occurred to me that we could enter into a business arrangement with Farmer John, change is business model, cut out that middle-man, and get this amazing product to the people we know. To me this had the double benefit of helping John, who is the best of men, and opening up an affordable line of ethically raised beef to my friends. That makes me smile. More money to John for the product. Farmers are screwed enough by having prices dictated to them. This helps us break that ridiculous paradigm. Less cost for John, as he’s not transporting them to an abattoir 2 hours away. The husbandry becomes less finicky for John too. The middle-man pays less than the piddling amount he pays anyway if the carcasses have fat over some middle-man-dictated threshold. I’d actually rather the cows have slightly more fat, as the meat is better. Fat is flavour! There is a much smaller carbon footprint, as we’re taking the beasts to a local abattoir. The carbon footprint here is relatively small anyway, as they’re raised close to home and any supplementary food is grown in the paddocks around them. 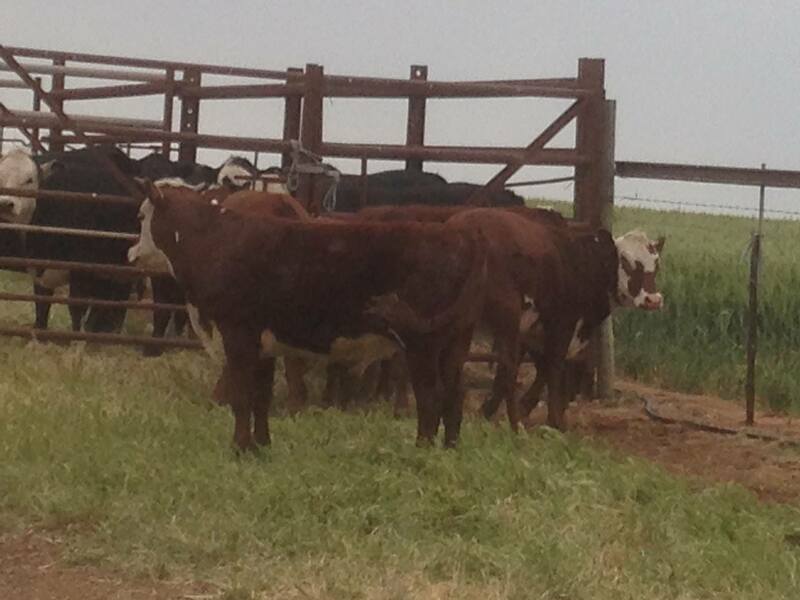 Farmer John has 3 or 4 cows that’ll be ready in the first quarter of 2015. We put out an expression of interest via social media, just to gauge the demand. As it turns out, there are a lot of people out there who want access to this kind of meat, and we could pass on John’s beef a couple of times over. I’d normally feed a cow on for 18 months to 2 years, but that’s not really an option when she’s living on somebody else’s property. We took her to The Other Farm last week, with the aim of having lots of BBQ meat for the Summer and for when my brother and his family visit in January. This was a good test of the logistics of our budding new commercial relationship too. We had to go pick her up in our newly jazzed up stock trailer and transport her to the abattoir. Stock trailer on a temporary trailer ramp. Farmgenuity at its greatest! 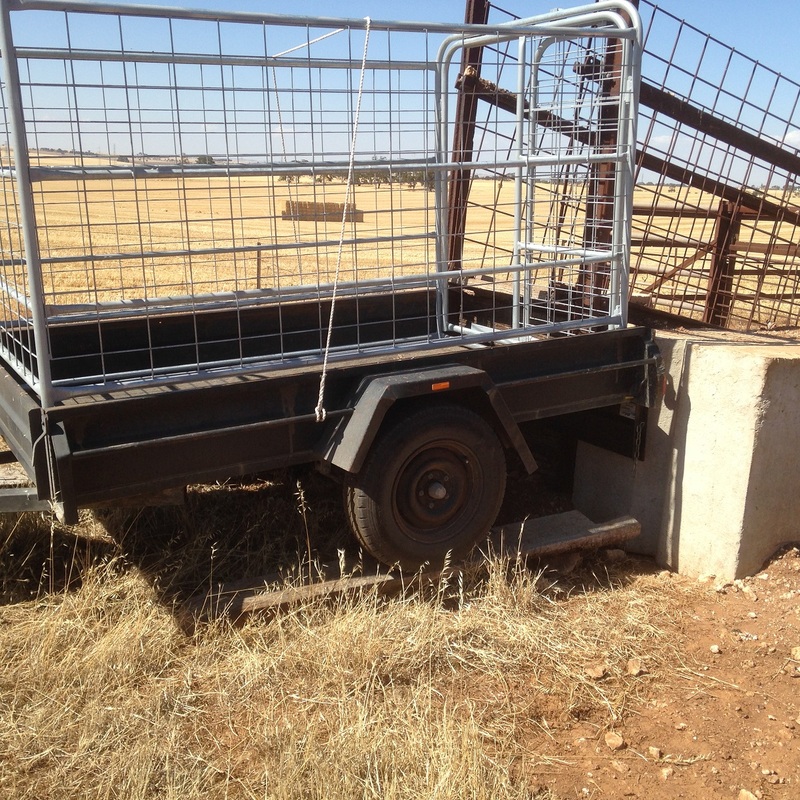 John’s cattle yards and ramp are built for trucks, so there was farmgenuity involved to build a temporary ramp for the trailer. It worked a treat though, and we’ll get something more permanent in place shortly. We’re used to animals that are tame. Our wildest animal will still come up and eat out of your hand and let you give them a love. Our tamest animals will let you drop the tail gate on the trailer, step out of the trailer, and then follow you into a holding yard at the abattoir. Harry, on the other hand, was born in the scrub block and had never been handled. She was WAY different to what we were used to. John and I herded her into a yard and were closing some gates when she ran back towards us. I was going to jump in, arms spread out, to herd her back, when John barked at me. I honestly didn’t know why I shouldn’t get in there with this effectively wild quarter-tonne animal. It never even entered my mind that she’d try and go through me. Harry ended up going up the ramp in short order, I closed a gate behind her, and she jumped into our trailer. She was unhappy with that, and banged around a bit, but she calmed down as soon as we took off. She transported perfectly, and unloaded at the other end without a lot of problems. On a side note, the holding pen we were going to unload her into had 4 other cows in there, all about Harry’s size. My plan had been to open an adjoining gate, get in there, and coax them into the next door pen. Again, it had never occurred to me that these animals would pose a danger to me. After seeing Harry’s reaction to us however, I let the young guy at the abattoir move them across. He was a pro at it too, using the swinging gates to get himself up and out of their way. Dad, Linhda, Peyton, and myself were all there for this entire process. After seeing Harry’s unhappiness we were all a little distressed too. We’d just never experienced an animal that was upset in any meaningful way, and we had a long, long, long talk about it. This was especially important in light of the fact that we want to do the same with 3 or 4 of John’s other cows. To me, this all comes down to keeping perspective. Harry lived her entire life in what must be close to Nirvana for a cow. She lived completely stress free, and was in amazing condition. She literally had a half-hour of stress in her entire life, and that was in the loading and transportation part we were involved in. For most of that transportation part she was sitting down and calm anyway – it was really only the loading that she was upset about. She spent the night in a yard with other cows, and would have calmed right down. The cows we’re getting from John in a month or three are actually half-tame, and shouldn’t be stressed when we load them. They’ve been loaded and handled before. Harry was pretty much the extreme test for us, being wild born and having no real human interaction. This was an invaluable lesson for us, and actually proved the logistical part of our plan to us. We now know that we can do this, do it properly, and do it in a way that is safe for both us (if I’m smart enough to stay out of the yards) and the animals. We probably couldn’t have asked for a better initiation.